Built in 652 during the Tang Dynasty, Giant Wild Goose Pagoda is a Buddhist pagoda situated at Southern Xi'an in the Shaanxi province of China. 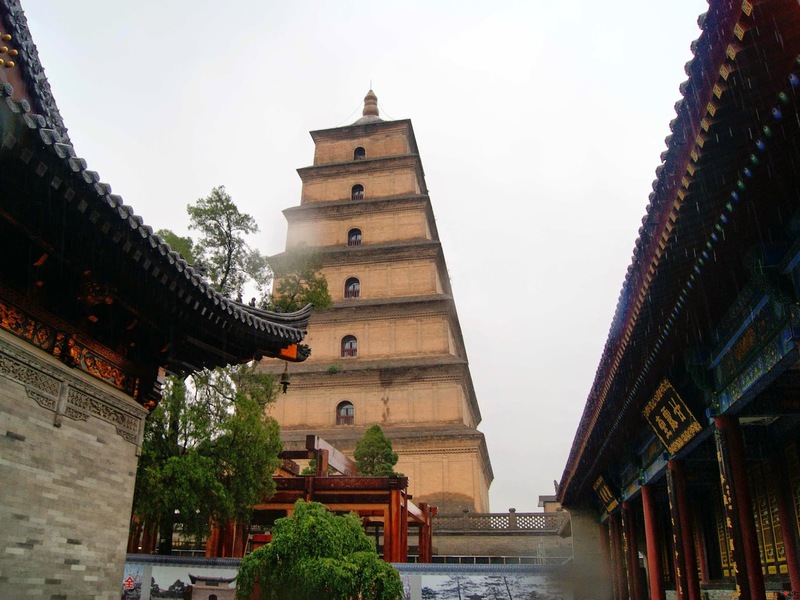 This pagoda is also known as Big Wild Goose Pagoda and in Chinese known as Dayan Pagoda is one of the finest tourist destinations in Xi'an 4 kilometers from the down town of the city. This pagoda is situated in the Da Ci'en Temple complex attracts tourists all over the world and famous for its unique construction style. The heritage pagoda is rated as 4A, which clearly shows its cultural and historic importance. Great endurance of 17 years! 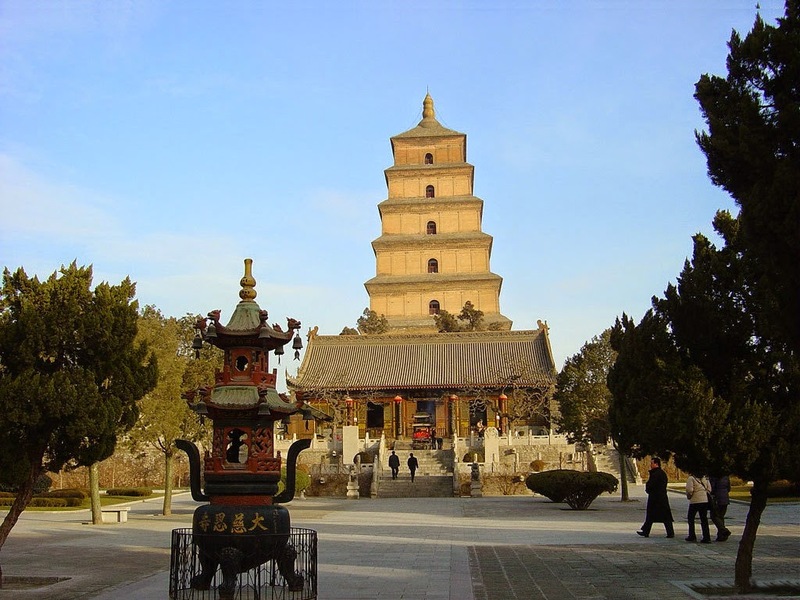 It is believed that Emperor Gaozong built this pagoda who ruled Tang Dynasty during 618-907. As per historians, hierarch Xuanzang carried out thrilling explorations to India by travelling 17 years passing through hundreds of countries and deserts along the Silk route, to reach India and started collecting Buddha relics. He is collected so many Buddha idols, sculptures and 657 sutras and brought them back to Xian. It is unbelievable to note that he had 17 years endurance to complete his voyage to accomplish the objectives. One could see his dedication, submission and the kind of efforts he has taken are beyond comprehension. Being the first abbot of Daci'en Temple, Xuanzaong supervised and completed the construction of this magnificent pagoda with the support of Emperor Gaozong. With the support of ruler by engaging 50 hierarchs in to the Pagoda the entire Sanskrit Sutras brought from India was translated in to Chinese language. It was about 1,335 volumes, considered as one of the biggest recorded translation project in the history. 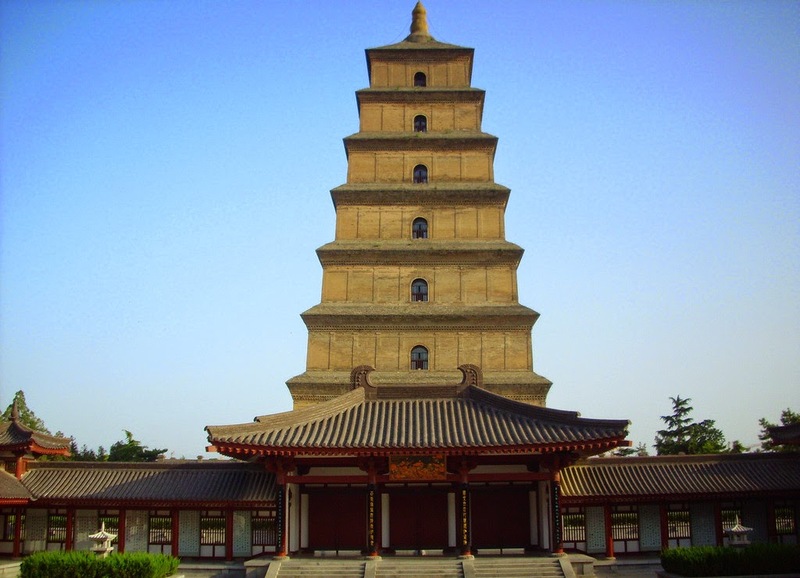 The original structure Pagoda was built with five storeys with a height of 60 meters, but later added another two. Today the height of the pagoda is 64.5 meters. The structure is square in shape made of bricks. Inside the structure, spiral ladder is provided to go up. The walls are decorated with engraved statues of Buddha. The art work was the creation of Yan Liben the famous artist of Tang Dynasty. 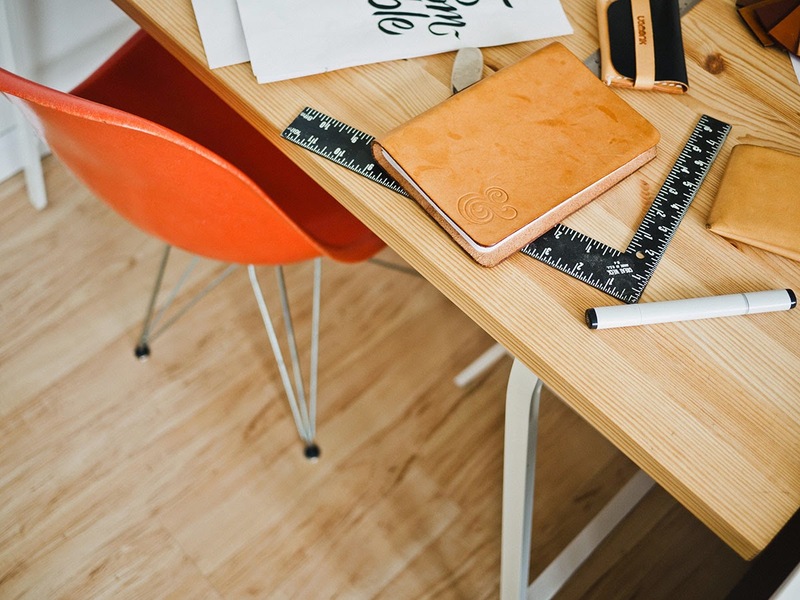 The Pagoda is simple in construction but with magnificent features. Through the stairs one can reach to the top of the Pagoda and have the panoramic view of the city through the arch shaped doors provided on the four side of the structure. 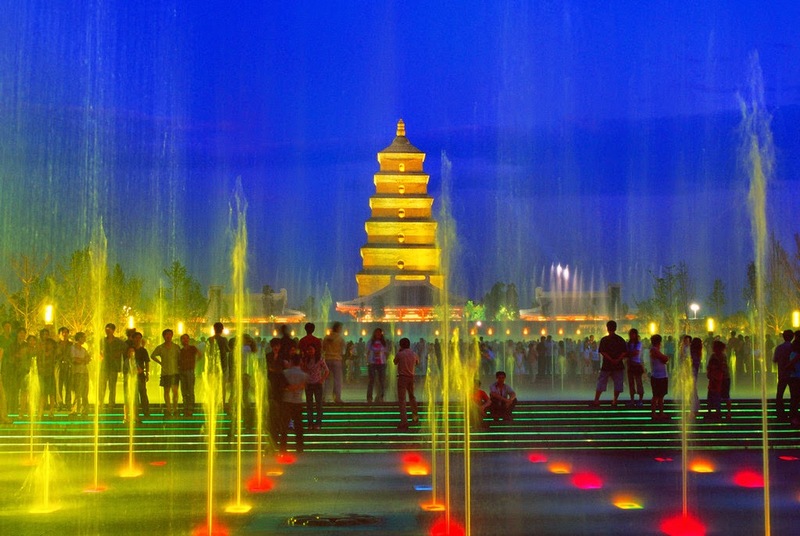 From Xi'an city there are frequent bus services to Giant Wild Goose Pagoda. Also there are enough taxi services which will cost only CNY 15 from the Xian Railway station. Xi' a city is well connected with air, railway and road net works from all over China. Entry to the pagoda is restricted against fee CNY 50 per head. Giant Wild Goose Pagoda is situated in the Daci'en Temple. The temple is a big complex spread over 32,314 square meters which is believed to be 7 times bigger to its present size. The temple constructed by Li Zhui during Tang Dynasty in 589 and rebuilt in 647 as a memorial to mother Empress Wende. Upon entry to the temple, tourists can see the Bell Tower, Drum Tower, the Hall of Mahaveer, Sermon Hall, the Hall of Xuanzang Sanzang and the Big Wild Goose Pagoda. Hilarious views, one can always carry with cherishing memories!